The land bakes RED. The sun sets ORANGE. The water flows BLUE. The clouds scud PURPLE. 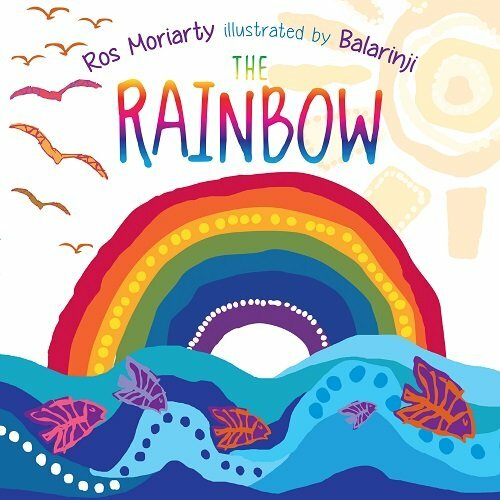 The Rainbow takes readers on a journey across the land in this fascinating exploration of the kaleidoscope of colours found in the Australian outback. The bright and colourful illustrations by Australia’s leading Indigenous design studio, Balarinji, perfectly captures the wild Australian outback with its diverse landscapes and wildlife. The text features simple subject-verb-adjective sentences (e.g. the sun sets orange, the water flows blue). The simple sentences in the book provide excellent models for children who are learning to construct grammatically correct sentences. It’s also a lovely picture book for children who are still learning their colours. A wonderful feature of this book is on the back page, where the author has repeated the story in Yanyuwa, the local language of Aboriginal families in Borroloola, Northern Territory, Australia. This gives children a fantastic opportunity to learn the words of a beautiful language - an excellent activity for events such as NAIDOC week. For further speech and language targets in The Rainbow by Ros Moriarty, see the list below.